Want to know about Denarau Island? 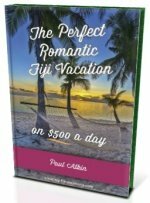 Find out all about this private upmarket Island including accommodation and transportation from Nadi airport. If you're looking for luxurious pampering and got cash to burn, Denarau is the place. Denarau's rise to popularity has to do with the convenience going along with 'more luxury per square inch in Fiji' factor that it brings. Denarau was built on reclaimed mangroves, shown by the murky water and grey sand. Just 20 minutes from Nadi International Airport, you don't have to go far for your pampered accommodation. This 2.55km² private island has the impressive 18-hole Denarau Championship Golf Course as it's centrepiece, almost completely surrounded by world class resorts and amenities. How is it convenient? For a start, Denarau Island is just 20 minutes from Nadi International Airport (where you will be flying in and out). If that's not enough, the resorts and hotels organise free transfers. 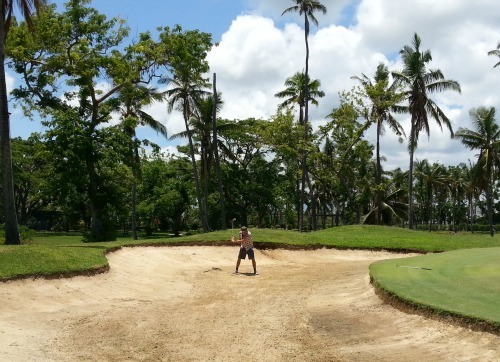 The relatively easy (even though I shot 20 over in 9 holes) Denarau golf course is also a mere stroll from your resort door. The most accommodating regularly servicing beer buggy had nothing to do with my golf performance! Port Denarau is your gateway for cruises to the picturesque island groups of the Mamanucas and Yasawas. It also is a dining and shopping hub of the island. For more information visit the Port Denarau site. You are in luck! Virtually all the cruises in Fiji leave from Port Denarau, less than a 3-minute trip from your resort lobby. Personally, I haven't done the overnight cruises, just the day cruises. However, I rarely hear a bad word about either. The cruises go to the postcard perfect Mamanuca and Yasawa chain of exquisite islands. Get all the lowdown in our hub Cruise Fiji section. Free transfer - most hotels on Denarau Island have free transfer vehicles waiting for each international flight. Bus - buses from Nadi bus station to Port Denarau is operated by West Bus Transport. The price is around FJ$0.70. Denarau staff often use this service. Taxi - they don't use meters, so confirm before hopping in. We have paid around FJ$30-$33 each way (for 3 people). 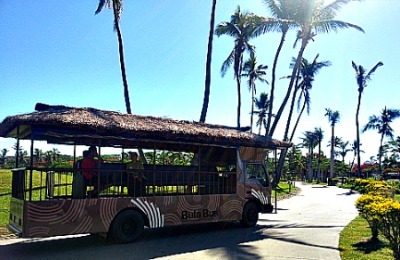 The Bula Bus leaving Denarau golf club. Taxis - At F$5 one way (approx. A$3/US$3), it can take you anywhere on Denarau. Walking - You can easily walk to the adjacent resorts to check them out. 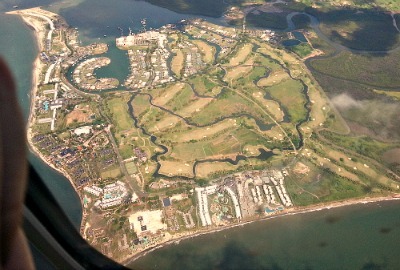 Routes are along the beach or inland along the golf course. Depending which resort you are staying at and the temperature, the port could be a sweaty walk. I give two thumbs up for the coastal walk checking out the hotels and their beach restaurants. If you want budget accommodation, you need to turn back around. Private upmarket Denarau Island is all about luxury. You can also find the location of these denarau hotels & resorts via the google map located below. 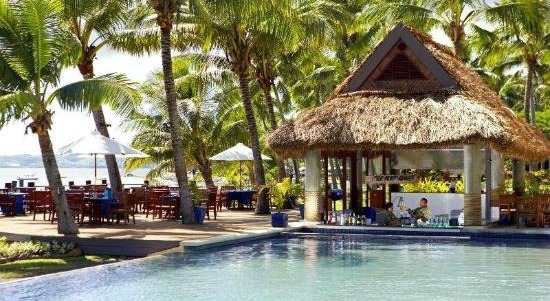 Fiji Beach Resort & Spa (Managed by Hilton Hotels) - has arguably the best 'beach' and dining on Denarau. It has seven big interlocking pools with all of it's rooms having a view of the beach. Sofitel Fiji Resort and Spa - has 296 rooms all overlooking the Pacific Ocean. You can expect the usual 5-star resort hotel amenities here. Westin Denarau - having Denarau's most beautiful spa, it is more adult orientated although kids are welcome and has a kids club. No free water sports although has 'Fire Walking' performances twice weekly. Sheraton Denarau Villas - as with the other Sheraton property on Denarau, you have full access to all three resorts. It has 2 and 3-bedroom villas compared with hotel rooms on the Sheraton Resort location. 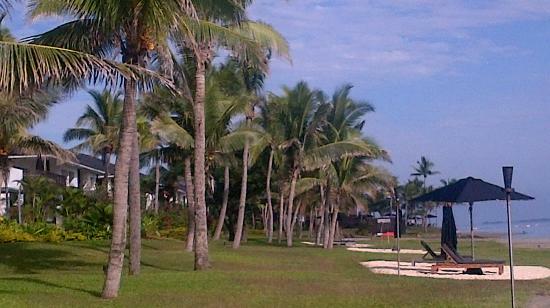 Sheraton Fiji Resort - at this 5 star resort, you have full use of all three adjacent Sheraton and Westin resorts. Family friendly, kids under 12 stay and eat for free. Radisson Resort - having 270 rooms including self-contained suites, lagoons, giant waterfalls, Denarau's best pool, and is child friendly. Worldmark Wyndham Resort - Your timeshare option on Denarau. Details forthcoming on how to join. If you are following the numbered system above, start with the yellow resort icon fartherest to the right. Click on the yellow resort icon for information.